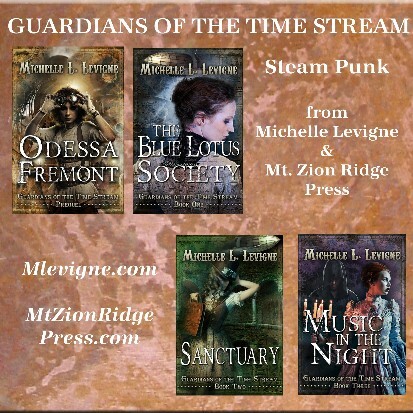 The Guardians of the Time Stream is a steampunk-ish series set during the reconstruction of the United States in the decades following the Civil War. Technology is on the rise, with locomotives and steam-powered industry, airships and other experiments in slightly anachronistic technology. A fascination with travel around the world and the exploration of other cultures, especially ancient cultures, is on the rise. The Guardians of the Time Stream, who call themselves the Originators, are determined to ensure the effects of certain events in history don't do any more harm to the planet than has already been done. Their secret: they are the descendants of travelers from our far distant future, who traveled into the distant past to prevent another group of time travelers from altering the world to suit their vision. And as Ess Fremont grows up and learns her heritage, her family's history and their secrets, she takes her place in the battle to protect the world.